Facebook wants to let you create virtual objects in its Oculus Medium sculpting platform or Facebook Spaces VR hangouts and then share them with friends who don’t have a VR headset. Today at Oculus Connect 4, Facebook previewed 3D posts, a new type of News Feed post where users can grab, spin and interact with a 3D object to look at it from all angles. Below you can see how you can pinch, zoom and rotate the objects in 3D posts. And rather than the objects just being static, you can actually open and close toy car doors, pose figures and more. Users will be able to create objects in Medium or Spaces’ marker drawing feature and then share them to the News Feed. And down the line, Facebook is working on an API to let third-party VR app developers give users the option to share their creations to the News Feed. Facebook will also soon allow augmented reality objects recorded with Facebook Camera to be shared into Facebook Spaces so you can play with AR in VR. These posts can already be shared to the News Feed from Facebook Camera. Spaces is also getting a bunch of new features. Beyond 2D Facebook Live broadcasts, Facebook Spaces users will soon be able to share 360 Live videos from inside virtual reality. Facebook has now cloned Snapchat’s famous AR masks and brought them to VR by letting your Spaces avatar try on different masks with themes like animals. There’s now dice, playing cards and drawing features. And in the coming weeks, you’ll be able to combine virtual objects you make or select into a “kit” that can be saved and opened up later so you can keep track of the pieces of your favorite VR costume or a self-made board game. 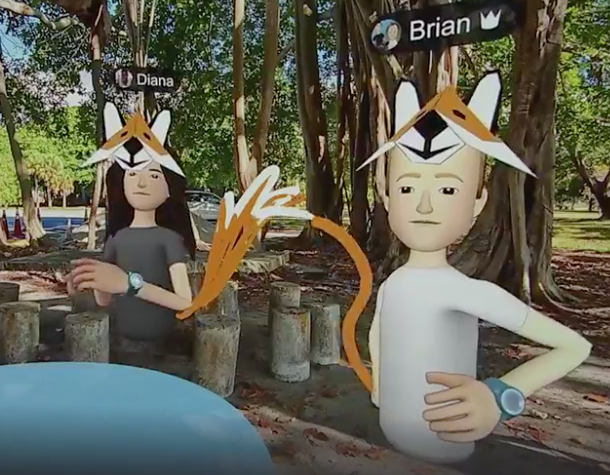 Facebook Spaces users will be able to interact with Oculus Quill illustrations made in VR. And Facebook is starting a “Build With Us” campaign that will let more developers create simple games or table-top versions of their immersive VR games for Facebook Spaces. All these features will give people more to do in Spaces, so there’s a real reason to get your friends to all put their headsets on and hang out synchronously no matter where in the world they are. The adoption of virtual reality hasn’t happened quite as quickly as many people expected. Facebook acquired Oculus more than three years ago, but headsets are still selling somewhat slowly. That makes all the imaginative content and games people produce for VR limited to a small audience. The 3D posts unveiled today radically expand the number of people who can play with things made in VR by letting this content escape the headset. Facebook actually first allowed 3D objects to be interacted with in the feed via 3D embeds from Sketchfab back in 2015. But now Facebook has built a standardized 3D format on top of which it can build more 3D creation tools. Facebook found that it could only create a constantly churning, always-interesting News Feed by convincing the whole world to make and share content. Now it’s embarking on a similar quest for VR. Rather than the company or a few big-name developers building everything in VR, the idea is that users themselves will be able to create objects, games, art and more. That could turn VR from a top-down, impersonal broadcast medium into a peer-to-peer network that gets better with each new person who enters the metaverse.